58 | TH E M R EP O RT O R I G I NAT I O N S E R V I C I N G A NA LY T I C S S E C O N DA R Y M A R K E T SECONDARY MARKET THE LATEST Fannie Mae Makes First- ever Front-end CIRT More than $3 billion in loans will be transferred. F or the past three years, Fannie Mae has trans- ferred a substantial portion of credit risk to mortgage insurance affili- ates. But until now, all of those transactions have been of the back-end variety. In late October, Fannie Mae an - nounced that it secured commit- ments for its first-ever front-end Credit Insurance Risk Transfer (CIRT) transaction to be executed with affiliates of mortgage insur - ance companies. When the transaction is com- plete, it will be the first CIRT transaction Fannie Mae has done on a "flow" basis, which means the transfer occurred before Fannie Mae acquired the covered loans, also known as a front-end transaction. The insurance cover - age becomes effective upon Fannie Mae's acquisitions of the loans. With this transaction, a portion of credit risk on pools of single family loans totaling $3.7 billion in UPB will shift to a group of approved mortgage insurance af - filiates. The covered pool contains 30-year fixed-rate loans with LTVs between 80 and 97 percent, ac- cording to Fannie Mae. The loan pool is expected to be filled over a six-month period, beginning with deliveries in the fourth quarter of 2016. "This innovative pilot transac - tion represents another milestone for Fannie Mae's risk trans- fer initiative. 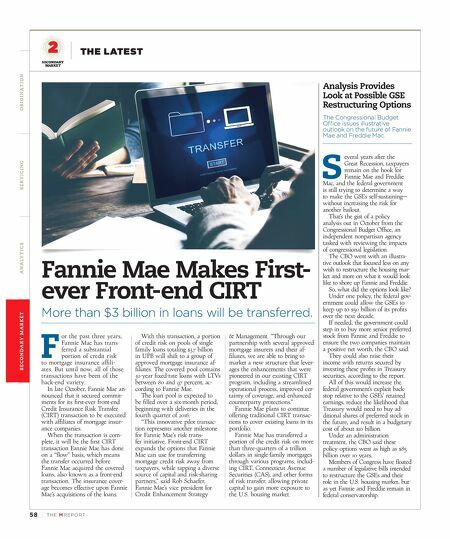 Front-end CIRT expands the options that Fannie Mae can use for transferring mortgage credit risk away from taxpayers, while tapping a diverse source of capital and risk-sharing partners," said Rob Schaefer, Fannie Mae's vice president for Credit Enhancement Strategy & Management. "Through our partnership with several approved mortgage insurers and their af - filiates, we are able to bring to market a new structure that lever- ages the enhancements that were pioneered in our existing CIRT program, including a streamlined operational process, improved cer - tainty of coverage, and enhanced counterparty protections." Fannie Mae plans to continue offering traditional CIRT transac - tions to cover existing loans in its portfolio. Fannie Mae has transferred a portion of the credit risk on more than three-quarters of a trillion dollars in single-family mortgages through various programs, includ - ing CIRT, Connecticut Avenue Securities (CAS), and other forms of risk transfer, allowing private capital to gain more exposure to the U.S. housing market. Analysis Provides Look at Possible GSE Restructuring Options The Congressional Budget Office issues illustrative outlook on the future of Fannie Mae and Freddie Mac. 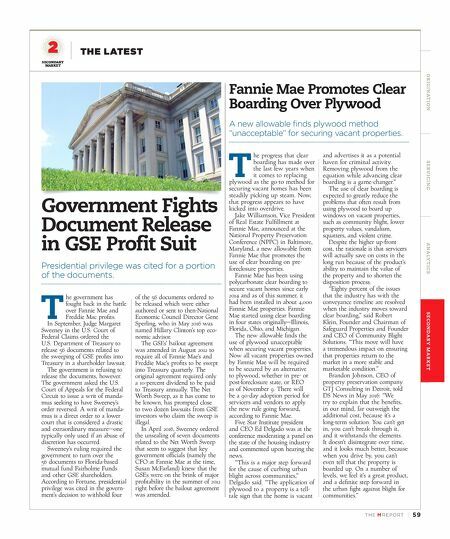 S everal years after the Great Recession, taxpayers remain on the hook for Fannie Mae and Freddie Mac, and the federal government is still trying to determine a way to make the GSEs self-sustaining— without increasing the risk for another bailout. That's the gist of a policy analysis out in October from the Congressional Budget Office, an independent nonpartisan agency tasked with reviewing the impacts of congressional legislation. The CBO went with an illustra - tive outlook that focused less on any wish to restructure the housing mar- ket and more on what it would look like to shore up Fannie and Freddie. So, what did the options look like? Under one policy, the federal gov - ernment could allow the GSEs to keep up to $50 billion of its profits over the next decade. If needed, the government could step in to buy more senior preferred stock from Fannie and Freddie to ensure the two companies maintain a positive net worth, the CBO said. They could also raise their income with returns secured by investing these profits in Treasury securities, according to the report. All of this would increase the federal government's explicit back - stop relative to the GSEs' retained earnings, reduce the likelihood that Treasury would need to buy ad- ditional shares of preferred stock in the future, and result in a budgetary cost of about $10 billion. Under an administration treatment, the CBO said these policy options went as high as $85 billion over 10 years. Members of Congress have floated a number of legislative bills intended to restructure the GSEs and their role in the U.S. housing market, but as yet Fannie and Freddie remain in federal conservatorship.